Huntington McLaughlin, the Marquess of Malvern, wakes in a farmhouse, after a head injury, being tended by an ethereal “angel,” who claims to be his wife. However, reality is often deceptive, and Angelica Lovelace is far from innocent in Hunt’s difficulties. Yet, there is something about the woman that calls to him as no other ever has. When she attends his mother’s annual summer house party, their lives are intertwined in a series of mistaken identities, assaults, kidnappings, overlapping relations, and murders, which will either bring them together forever or tear them irretrievably apart. Firstly, what a fabulous book! I haven’t read any of Ms Jeffers work before, but I have been an avid follower of her highly interesting and educational blog, so even before I read this, I knew that I would be in store for something good. But this is really something special, its exciting and equally enchanting, the story line of destiny has brought Hunt and Angelica together through the most difficult things people could experience, really pulls at the heartstrings. Huntington McLaughlin isn’t no ordinary Marquess, he is a secret agent for the crown. He is a man who despite having a huge responsibility on his wide shoulders cannot think of anything worse than settling down and marrying the ditzy young woman who his father has arranged for him to meet. Hunt is never happier than putting on a disguise and being someone else, just a while. Hunt has got a lot of pent-up tension coursing through him, you get a sense that he wants to branch out do thing’s his own way. He is an intelligent man how feels that while doing his Marquess duties he is restrained and controlled, he loves the freedom that being an agent gives him. He also has a deep darkness within him, he was taken prisoner by the French and it was only due to his father paying his hefty ransom that he was released so obviously Hunt owes the Duke his very life, and his sanity which is why he agrees to go through with what his father wants. But the memories of his capture still cling to him like dust. The beautiful, American Angelica Lovelace has been brought back to her parent’s homeland so that she can forefull her mother’s dying wish; to make her society debut and make a good a good marriage. But that is so far easier said than actually done, as our Angelica is very picky she want’s what her parents; a proper love match and not just an arranged marriage like so many of the Ton have to endure and then there is the fact that she already has the ideal man, the man who sends her heart a flutter and who she trusts inexplicably. The problem is, her ideal man, her soul mate is nothing more than a figment of her over active imagination, that is until one day in Regent’s park she spies a man with the face of her hero. Angel opened her eyes to look upon the sharp angles of his ruggedly handsome countenance. “You are my world,” she whispered as their gazes met and held…. Angelica is a passionate and loyal young woman, she wants to please her father by doing as he and her late mother want, but she has a wild stubborn side that won’t allow any man to bend her to his will. She knows her own mind and she is proud of that. So, when she meets Hunt, she amazes herself to have fallen for him. She sees real pain in his eyes and she will try to do whatever she can to ease that pain. I really like Angelica, she is bright and she knows what she wants, she won’t be pushed into something she doesn’t want. On her way north to attend a house party, during the storm that is raging her carriage get in trouble and ends up crashing killing her driver and servants leaving her stranded at the side of the road. That is until she comes across a rider who has a suffered an accident himself, he is unconscious with a head and shoulder wound, with a bit of ingenuity Angelica manages to get herself and the unconscious stranger to a little farm where they take refuge. To protect her reputation and that of the stranger’s she states that they are a newly married couple, so that the farmer and his wife will take them in. She tends to his wounds and looks after him until he wakes, only for when that happens he wakes not knowing who he is or unable to remember a thing about his life. Hunt wakes to a beautiful Angel tending him, an angel who claims is his wife. He is in the dark he cannot remember anything the only real, tangible thing he knows is what this beautiful woman has told him. Hunt feels an instant connection towards her, she is the lightness he needs to bring him from the dark. “I am gladdened by your progress.” Hunt said in a teasing tone. “I move as if I am a man many years Wendt’s senior, but my wife approves. I am a blessed man.” She blushed, an action quite hard for him to resist in its appeal. If he were well, Hunt would kiss her thoroughly to keep that touch of color upon her cheeks. It soon comes to light that they aren’t married and she has made it all up, but for good reasons. His brother Harry and best friend Lord Remmington take him back to his ancestral home – The Devils Keep – where things take an unexpected and frightening turn that brings Hunt and his Angel back together again, only for his friend to take a keen interest in his Angel. Hunt soon finds out that because of his title, he must marry well. Can an out-spoken American really be the woman for him? Now I do like Remmington, he is an intriguing man. A complex one, but he’s super smooth and has defiantly got the gift of the gab when he decides to charm Angelica, she doesn’t even realise what he’s doing. But that’s not surprising, with him being a spy. With a murderer on the loose, dark secrets coming out of the wood work at every corner, the spy master hovering about with knowledge that Hunt needs to know and his so-called best friend and fellow agent; Remmington making a move on the only woman who has caught Hunt’s heart. Over all it is a highly enjoyable read, the romance between Angelica and Hunt simmers and sizzles nicely, Ms Jeffers has done a lovely job at building up their relationship from when Hunt gets injured right to the end, you never know in which direction their story is going to take as there is so much that stands in their way. Yet, that connection that they share, that Hunt has especially, is tender and loving and at times you are just as agonised as he is. I really like how Jeffers has mixes a romance novel with a murder, kidnapping an espionage thriller, I found it exciting, romantic and one that I highly recommend. 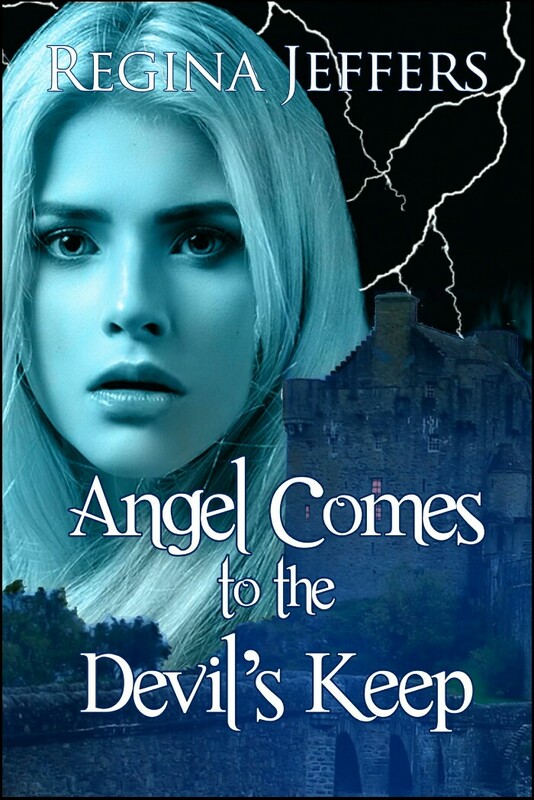 Angel comes to the Devils Keep is out now and can be found at Amazon. This entry was posted in Complimentary copy, Historical Romance, Reviews and tagged Angel Comes to the Devils Keep, Black Opal Books, Complimentary copy, Historical Romance, Regina Jeffers, Review. Frankie, I’m just writing my own review of this book and so I’ll check back and read your review once I have posted mine. It will interesting to compare thoughts. No problem, Carol. I’m looking forward to reading your views on this book too. Thank you for accepting me under your wing, Frankie. I am blown away by your kind words. It’s an absolute pleasure to review your work, and I was equally blown away by this book. I loved it, I’m reading Remmington’s story next and I can’t wait. Thank you! I am writing book 3, Lady Chandler’s Sister, which is Sir Alexander’s tale. Ooh!! I can’t wait to read that one. Lovely review, Frankie. You have captured the essence of the story perfectly.